Life on The Scrap Heap: A Penguin Love Triangle? I can't help thinking these three little penguins may be in the middle of a penguin love triangle. The one on the right may be a little jealous of the twosome on the left, although at least she's still smiling....what do you think? PERFECT for the sketch!! 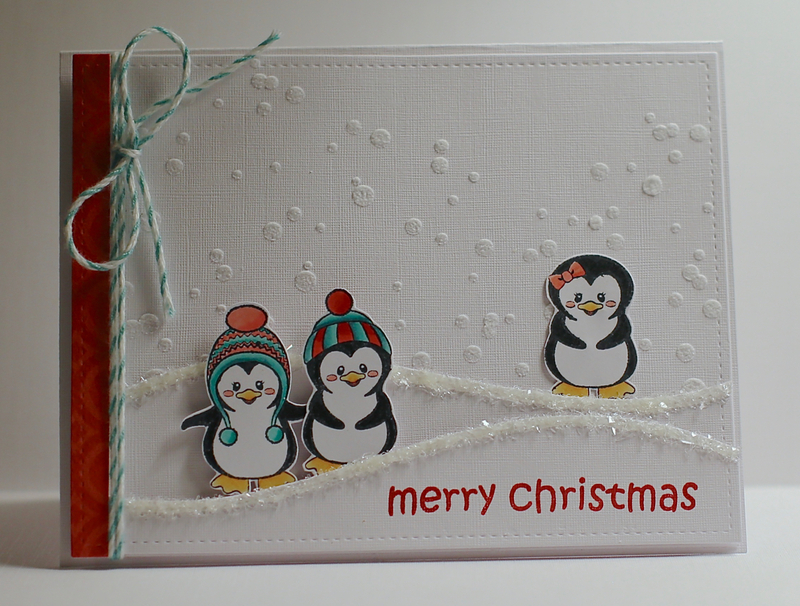 I love how you have used all of that open space for the snowy sky with a pop of cheerfully colored penguins! Thank you for playing along with us at Freshly Made Sketches. SO cute with those penguins and glittery hills of snow...just love the title lol! What a fun description of your card! I love your design and the addition of the glitter. Really cute penguin card. Perfect for the sketch challenge. Oh, my, your little penguins are so cute and super adorable, Claire!!! I really like their hats!!! The white twine is so beautiful and I love the fun little bow on the side!!! So sweet!!! !